Supply chain design and operation problems are complicated in many fronts due to intervened decision making. One of the main complications is related to inventory decisions and costs. In many cases, considering inventory in the overall supply chain domain introduces stochastic and nonlinear formulations. Ignoring inventories, as in the traditional approach, results in inferior supply chain designs and operations in terms of cost performance. Economic order quantity (EOQ) models, with their simplicity, intuitive explanation, and clear implementation, aid in the resolution of these issues in a number of integrated supply chain problem contexts. 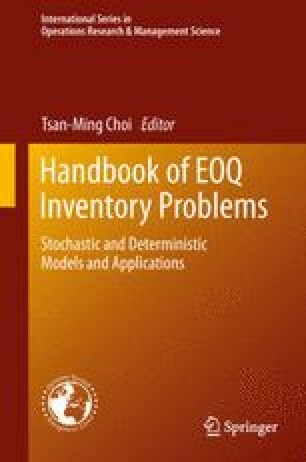 In this chapter, we summarize the role and utility of EOQ models in these integrated supply chain design and operation problems. Specifically, we consider the three pillars of supply chain management: location, transportation, and inventory. We discuss how EOQ models ease the analysis of integrated supply chain models under each pillar in detail including inventory-location models, inventory-routing models, and multi-echelon inventory models.